It seems like a strange way to fish—chasing an empty milk jug across a river. When you want a mess of catfish for dinner, however, jug fishing is one of the most fun ways to make it happen. On this day, my fishing buddy paddles hurriedly, trying to pull our johnboat alongside a jug that has become animated and is speeding away. The catfish pulling the jug wants no part of this. The jug sounds and then reappears 20 feet away. This encourages my friend to paddle faster, and this time, we reach the jug before it submerges. I swing a landing net beneath it and bring up an 8-pound channel cat, our tenth of the afternoon. Before the croaking fish is unhooked, another jug cuts a wake across the river, and we’re soon chasing it as well. For pure country-boy excitement, nothing equals jug fishing for cats. Decades ago, folks called it “blocking” because blocks of wood were used to float the participants’ catfishing rigs. Nowadays, empty milk or soda jugs are more likely to be used. Save a few, tie on some line, add hooks, bait ‘em up, and you’re ready to jug fish. The only other necessities are a boat and paddle (or trolling motor) for pursuing your quarry, and a big net for landing the cats you hook. Any narrow-necked plastic container with a tight-fitting lid can be used to make fishing jugs. I prefer 1- to 2-liter soda bottles. When sprayed with fluorescent orange, chartreuse or black paint, they’re easy to see, and most catfish can’t hold one under too long. The latter characteristic is important because you want the jug to exhaust the catfish enough you can more easily net the fish. I rig each jug with soft Dacron or braided line because it doesn’t get as loopy and hard-to-handle as monofilament. Use 50-pound-test or more, in case you hook a whopper. Tie directly to the jug’s handle or neck if you like, but jugs tip up better, signaling strikes, if you attach line to the cap instead. Do this by drilling a small hole through the cap, running the line through the cap from outside to in, and tying to a small metal washer to the inside so the line won’t pull back through. Screw the cap back on and you’re ready. Tie plenty of line to each jug, then lengthen or shorten it as needed. Do this by wrapping line around the jug and securing it with tape or a rubber band, or by loosening the washer and stuffing line inside the jug. The latter method is best if you want the jugs to tip up when a cat takes the bait. For cats up to 15 pounds, I use one or two 1/0 to 3/0 circle hooks, which usually impale the fish in the corner of the mouth. Two hooks rigged tandem, one above the other, allow you to test different depths. When trophy cats are targeted, I prefer 5/0 or larger circle hooks that accommodate larger baits. Each hook must be needle-sharp. It’s sometimes helpful to tie a bell sinker above or below each hook to hold the bait near bottom and to slow movement of the jugs when it’s windy or the current is strong. Add your favorite bait—fish pieces, night crawlers, hot dogs, stinkbait chunks, etc.—then release the jugs several feet apart and let them drift in the breeze or current. Check regulations for jug fishing restrictions before you go, and limit the number of jugs you use so you can properly watch them and be sure none are lost and left to litter the lake or river. Float your rigs near catfish-attracting structure and cover for more hookups, but always fish several feet away from tree tops and rocks so your jugs won’t snag. Follow at a distance so you don’t spook fish, but be ready to react the moment you see action. Each jug functions like a big fishing bobber. When a catfish bites, the jug stops and bobs. When the bait is swallowed, one of two things happens: the jug zips away across the water, or it disappears beneath the surface. This is where the fun really starts. Move in as fast as you can and try to grab the jug, dip a landing net beneath it or snag the line with a long pole that has a hook on the end. When using your hands, grab the jug, but never the line. If you grab the line, you could get tangled or cut. If you’ve hooked a small catfish, you probably won’t have much trouble. But when a big cat takes the bait, the jug may sound then pop up several yards away time and time again before you get close enough to snare the rig. Spooky catfish may surge away every time you get near. For this reason, it’s best to take a buddy each time you go jug fishing. One of you paddles or operates the motor during the pursuit. The other stands ready to capture the fleeing cat. Both wear life jackets, in case of an unexpected spill. Good baits include night crawlers, minnows and chunk-style commercial baits. My favorite, however, is an old-style recipe for marinated hot dogs. Cats love dogs when they’re prepared this way! Start with a package of cheap hot dogs. Inexpensive frankfurters made from variety meats work better than others in my experience. Cut the franks into bite-sized pieces—eight to 10 pieces per hot dog. Put the pieces in a zip-seal plastic bag or other plastic container, then add two or three heaping tablespoons of minced garlic and one package of unsweetened strawberry Kool-Aid. Add enough water to fill the container, shake it up to dissolve the Kool-Aid and refrigerate overnight. Hook a piece of hot dog when you’re ready to fish, pushing the hook point all the way through and leaving the barb exposed. Then prepare for action. You’ll have cats chasing dogs in no time! You can keep the marinated franks in the fridge for weeks so you’ll have a ready source of bait whenever you go jug fishing. 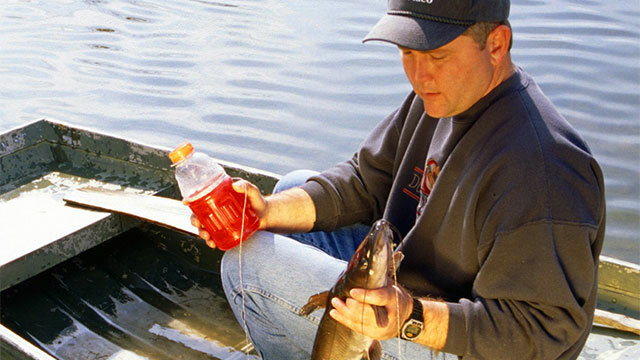 Jug fishing is a simple way to catch catfish, tailor-made for children and adults who never grew up. Load up this season and give it a try. For high-level excitement and downright fun, nothing beats jug fishing.